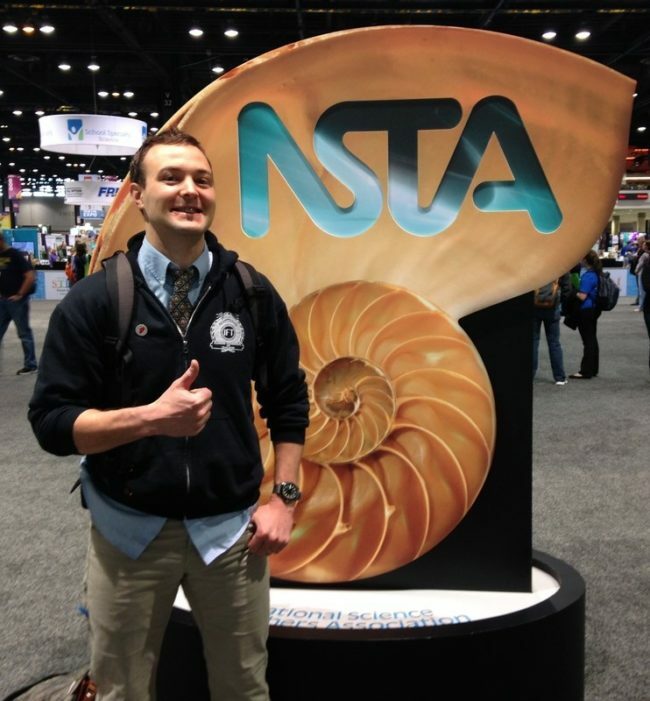 Brandon Rutherford presented on his aquariums and project-based curriculum at the 2016 National Science Teachers Association conference. 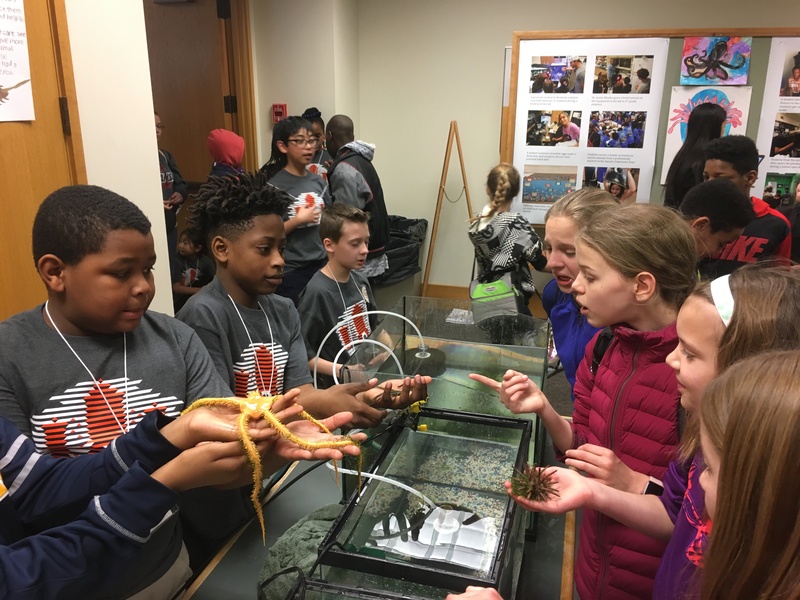 Students from Stratton lead a science-outreach event at the University of Illinois that was attended by over 1,000 people from our community. 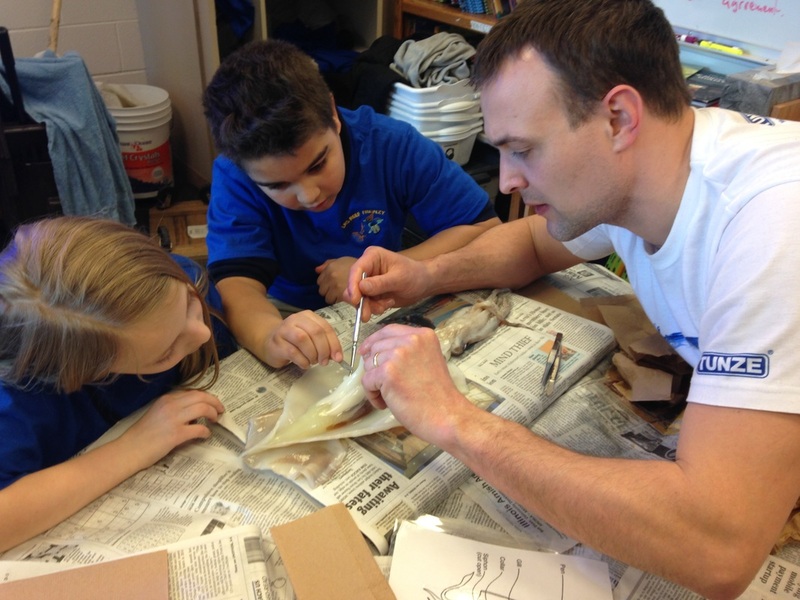 Brandon helps students complete a dissection lab. Understanding physiology is very important in the care and study of animals. 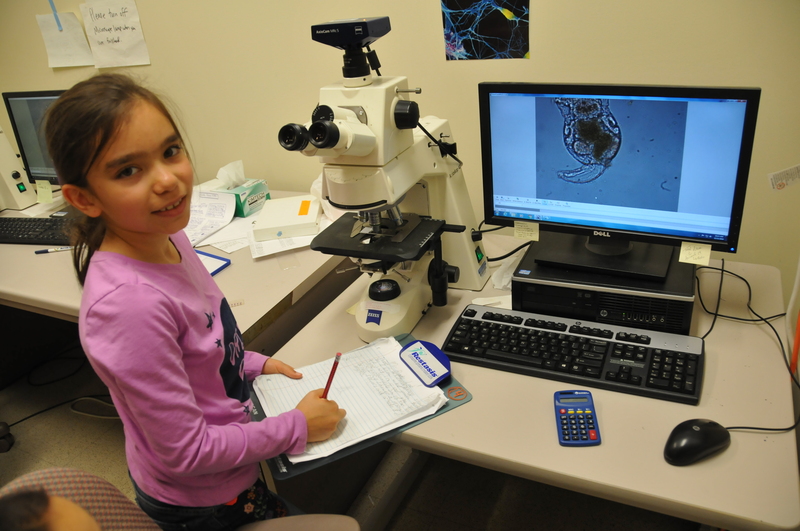 Evani, a Stratton student, checks the health of the rotifer culture she helps maintain using imaging equipment at the Beckman Institute, one of our community partners. 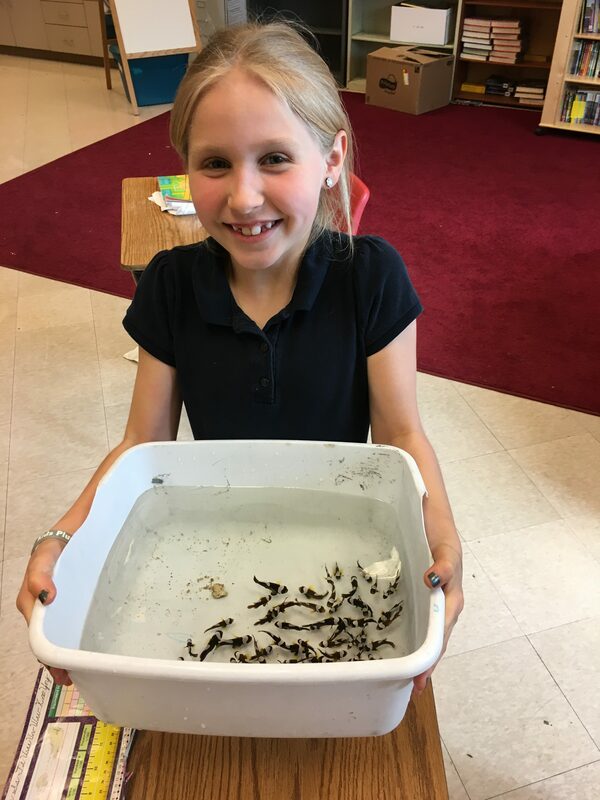 Alice, a Stratton student, sorts fish she cultured in her 4th grade classroom. Clownfish grow at different rates and need to be regularly sorted by size to prevent aggression. 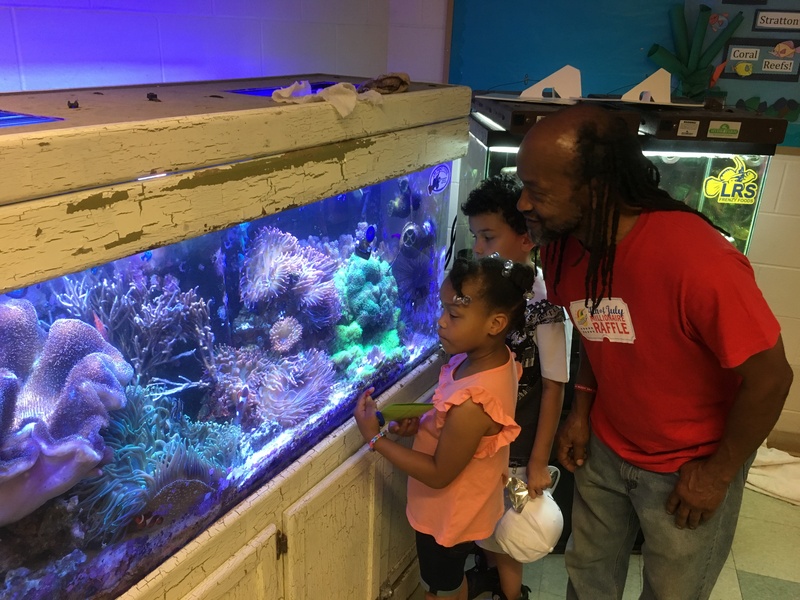 Visitors to Stratton Elementary check out one of the school’s 3 coral reef aquariums, part of the over 1,200 gallons of aquarium space in the school. 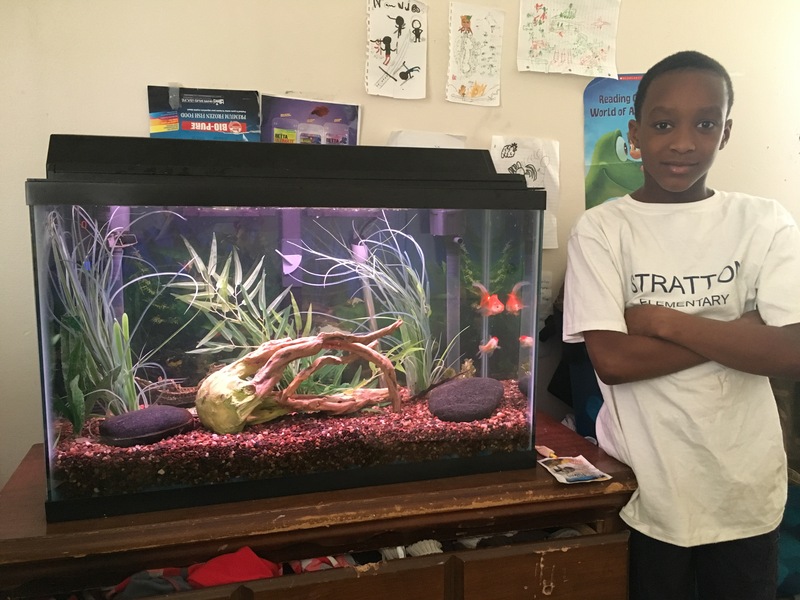 Cornelius, a Stratton student, stands proudly by the aquarium in his bedroom. Cornelius collected some of the fish for his tank from local streams. Nipun, a Stratton student, stands by an aquaculture setup designed by his 5th grade class. Each day, Nipun and his classmates measure the health of the plankton cultures they raise for their fish breeding program. 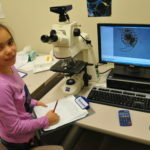 The importance of children studying nature and biological systems is grounded in decades of research. I believe that recent changes in education, including the increasing use of digital curricula, shift focus away from natural learning experiences and are affecting childhood experiences at school. The natural world presents complex phenomena for study and is intrinsically interesting to children. Immersing students in the study of natural systems provides unique opportunities for learning that can’t be otherwise replicated. 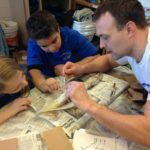 As much as possible, I try to meet elementary learning standards through project-based learning where students interact with nature, both by going on multiple field trips (14 last year) and by bringing plants and animals back into the classroom for study. 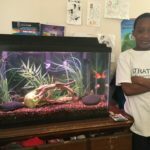 Early in my teaching career, I chose to focus on aquatic ecosystems because of my students’ interest in keeping freshwater and marine aquariums. 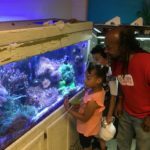 Aquariums are great classroom ‘pets’ and coral reef aquariums are perhaps the only way that teachers can model and study ecosystem dynamics in the classroom. To this end, I have helped students at my elementary school build and maintain 12 marine and coral reef aquariums and we currently have over 1,200 gallons of aquarium space in our school. Though our primary focus is on marine biology, the scientific principles we learn are analogous to freshwater ecosystems and most of our outdoor study and community stewardship focuses on studying the great lakes and local streams and waterways. I believe that it’s important to infuse Great Lake topics into education because of the importance the Great Lakes play in education. 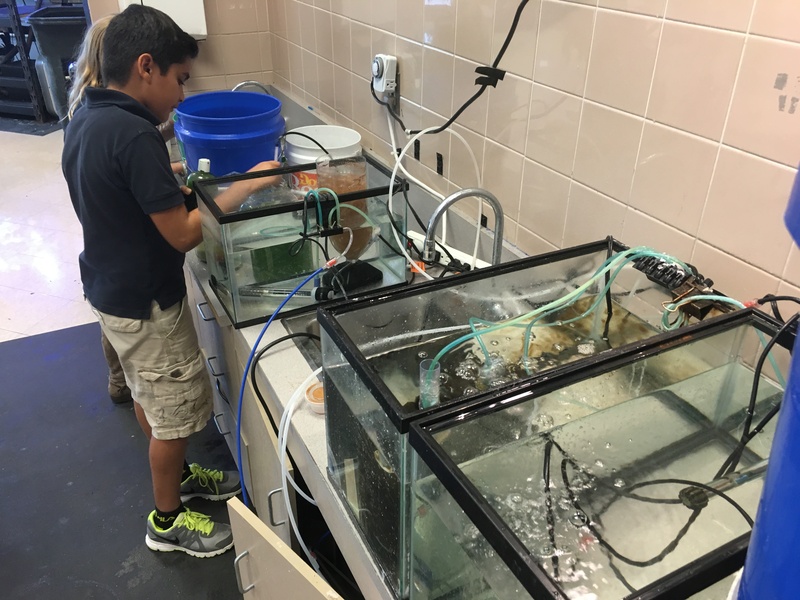 I love almost everything about teaching and studying biology, but I’m especially proud of my students’ work in creating aquaculture systems in our classroom. An important part of environmental restoration in the Great Lakes and other waterways is the captive breeding and release of fish. In the last 3 years, students at Stratton have cultured clownfish from eggs laid in our classroom coral reef aquarium. Breeding marine fish is a complex task very different from raising freshwater fish, and is something even professional aquarists have difficulty with. Newly hatched clownfish are planktonic and only a few millimeters in size. The clownfish larva are very particular about what they eat and must be fed live microorganisms such as rotifers and artemia. Handling and hatching the eggs, culturing and feeding the microorganisms, and maintaining proper water chemistry in the breeding tanks were tasks some considered beyond the ability of elementary school students. 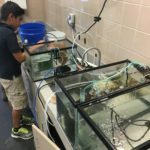 Through hard work and trial and error, my students developed lab procedures using DIY equipment to raise over 500 clownfish from egg to maturity. Our fish were sold nationally through our sponsor Quality Marine, and by supplying captive-bred fish, my students helped prevent the collection and sale of wild clownfish from the ocean. I believe that all of the hard work and extracurricular study conducted by my students wouldn’t have been possible without them being passionate about fish-keeping and environmental sustainability. And though we weren’t focused on culturing freshwater fish, the lab procedures and technical skills my students have learned will help them to successfully work in any biology lab. Stratton Elementary serves a predominantly low-income student population with 78% of the children qualifying for free and reduced lunch. Children who live in poverty are more likely to have unmet social and emotional needs, particularly the need children have to exercise agency over their life experience. Research shows that when students are given meaningful responsibilities and can self-direct learning activities at school, their academic performance and participation increases. One of the reasons I love including Great Lakes and other aquatic biology content is that students are actively interested in the topic and proactively engage in curriculum. 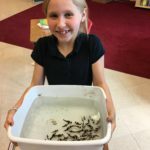 This engagement is especially high when students are taking care of our school’s aquariums. Many of my students live in places that don’t allow pets and may not be trusted with expensive equipment or completing sensitive tasks. Gifting children with the faith that they can and will keep our coral reef ecosystems alive gives them ownership over the learning experiences. Almost always, students rise to the occasion and are able to accomplish many things thought beyond them. Many teachers, especially elementary school teachers, do not have formal instruction in all of the science content they must teach. I do have an undergraduate degree in biology, but I am not an expert on fish and aquatic ecosystems. Therefore, finding mentors has been very important to my classroom practice. Luckily, I have found many scientists and other professionals who are very interested in supporting marine and freshwater biology instruction and I have invited them into our learning community. My students and I have grown particularly close to two experts on fish and aquarium keeping: Lou Eckus from Tropic Marin and Cindy Delillo from Quality Marine. Both provide ongoing technical and educational support, answering student letters, skyping with our classroom, and help have developed a personal and ongoing relationship with many of my students. I believe that this relationship is really important. Having professionals understand and personally validate my students’ hard work helps make it ‘real’ to them. One of the most important parts of our year is when our class makes the 3-hour trip to Chicago to attend an annual marine biology and aquarium-keeping conference where we are able to meet most of our adult science friends in person. 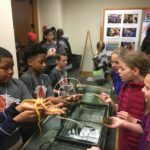 One of the reasons my students are so engaged in learning about aquatic environments is that they feel personally invested in environmental outreach and education. Each year we set up a number of exhibits in our community to raise public awareness of issues affecting aquatic ecosystems. Most notably, we participate in the University of Illinois annual Engineering Open House, representing our sponsor, the Beckman Research Institute. At our last event, over 1,000 people attended. Check out Brandon’s website: mrrutherfordisawesome.weebly.com.